Last chance to save $500 on our upcoming January 2013 NGH Approved Banyan Hypnosis Certification Super Course. This weekly special ends November 19, 2012. 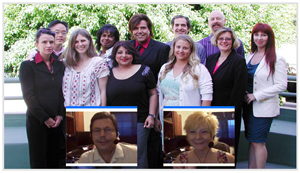 Our NGH Approved Banyan Hypnosis Certification Super Course is one of the most recognized and respected hypnosis training programs in the world. Learn directly from award winning hypnosis trainer, Cal Banyan, and receive all the training and support you need to become a certified hypnotist or hypnotherapist. You can take this course online or live at our hypnosis center. To enroll in this course, click here. Photo of July 2012 Class! "5-PATH® and 7th Path are the missing links in the therapeutic modalities being offered today. As a psychotherapist, this work opens up a whole new approach to deepening and also speeding up the therapy process. Any psycho-therapist could benefit from taking this course." "Through the process of 7th Path Self Hypnosis, I became aware of a deep seated anger. Through the 5-PATH® technique, I released that anger and replaced it with a sense of love and hope that, prior to this course, I would not have experientially know." I can verify that Cal Banyan has created and led such a course with the 2 weeks certification course. The teaching of 7th Path with 5-PATH® also satisfies the Hippocrates oath that healers also must heal themselves." To learn more about this hypnosis certification course, click here. No other hypnosis training program offers you a better training program or better support after graduation, that's why our grads are so successful. Give our office a call at (714) 258-8380 or 800-965-3390.